In a thrilling discovery, detailed in a paper published February 7 in the scientific journal PLOS ONE, the earliest human footprints found outside of Africa appeared in May, in ancient sediment along the English coastline at low tide, near Happisburgh, in Norfolk. The ocean washed them away, but not before they could be studied by scientists and preserved on video, which is scheduled to be shown as part of the new exhibit, Britain: One Million Years of the Human Story. The exhibit opens at the Natural History Museum in London on February 13, and continues through September 28, 2014. The assumed species of human kind squishing that ancient mud between their toes may have reached Norfolk some 800,000 years ago via a land bridge. 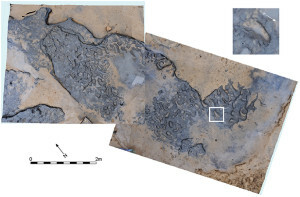 At many times in the distant past, Britain was a peninsula directly connected to Europe, and that is believed to be true of the era when these footprints would have been made, possibly by a family searching a riverbed for food. But a cooler climate would have removed such peoples to Southern Europe shortly afterwards. The earliest record of human artifacts in Britain dates from about 500,000 years ago, belonging to Homo heidelbergensis, the species believed to have evolved into the Neanderthals, our distant cousins who thrived in Europe and Britain until shortly after the arrival of our own species, Homo sapiens, some 40,000 years ago. And since our own recorded history, including all our various legends and creation myths only goes back a scant 6,000 years, we are still talking about a verrrrrrry long time ago. “This discovery gives us even more concrete evidence that there were people there. We can now start to look at a group of people and their everyday activities. And if we keep looking, we will find even more evidence of them, hopefully even human fossils. That would be my dream”. I read about the footprints in Science News, amazing. I still think they were headed to a cave pub!